P2	P4	P5	P7 What are Natural Resource Charter precepts? In 2015, the parliament of the Democratic Republic of Congo split the country’s 11 provinces into 26 by passing an administrative law. The provincial split, known as découpage, significantly altered the distribution of benefits from mining revenues. This briefing maps changes to revenue flows and shows that with the new borders, mining revenues are concentrated in three new, smaller provinces. It outlines existing challenges related to lack of clarity and transparency in the DRC’s mineral revenue sharing system and how they may be exacerbated post-découpage. 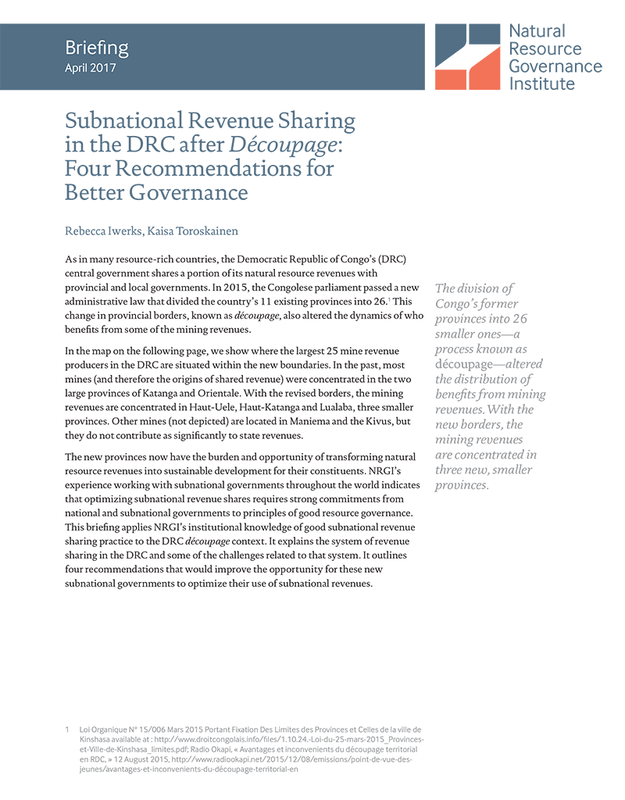 Finally, it applies NRGI’s institutional knowledge of good subnational revenue sharing practice to the découpage context and outlines four recommendations that can help these new subnational governments to optimize their use of subnational revenues.